Our Alloy 20 steel is a solution for stress corrosion cracking that can occur when stainless steel is introduced to chloride solutions. We supply Alloy 20 steel for a variety of applications and will help in determining the precise amount for your current project. Alloy 20 can be used for a wide variety of applications including: control valves, pressure relief valves, and centrifugal pumps. It is composed of carbon, chromium, copper, iron, manganese, molybdenum, nickel, phosphorous, silicon, and sulfur. 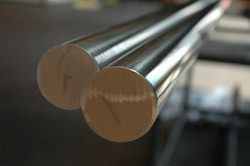 Best Stainless provides its customers with a vareity of alloy 20 steel stock shapes under the high quality standards of UNS N08020 and ASTM B473.